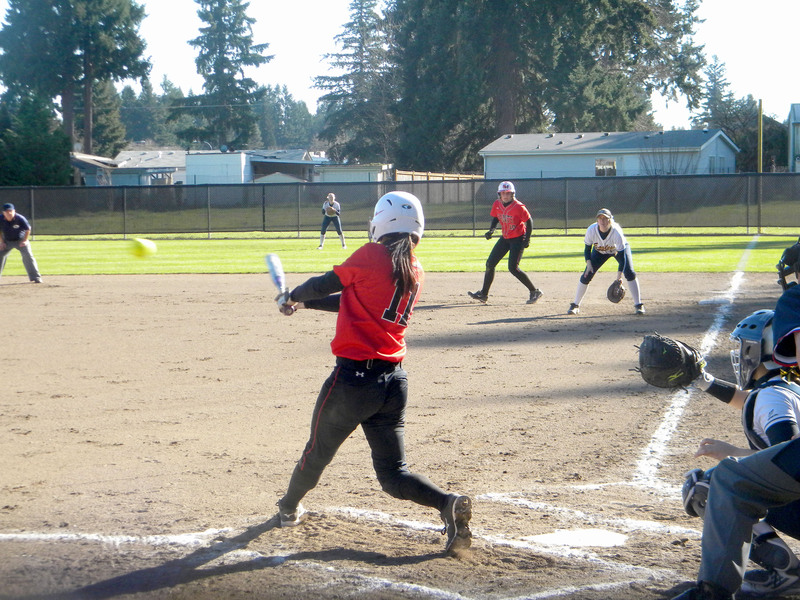 On Feb. 28, a sunny Saturday afternoon at Saint Martin’s University, the Saints softball team hosted Northwest University and looked to continue their six game winning streak. First-year Kim Nelson got the start on the mound for the Saints going three and 2/3 innings giving up three earned runs on two hits while striking out five batters. Offensively, the Saints struck first when senior Sam Munger doubled to left field scoring Mary Dettling. Saint Martin’s continued to add on in the second inning when Dettling doubled to right field scoring Lindsay Miller and Kana’i Smith, and in the third inning when Taviah Jenkins scored on a fly out to third base. In the fourth inning, Northwest would pull within one run on a bases clearing double of Nelson to make it 4-3. Munger would then come in to replace Nelson, shutting out Northwest for three 1/3 innings giving up only one hit and striking out five. Nelson recorded the win for the Saints to improve to 4-4 on the season, while Dettling led the way offensively going 2-4 with two RBIs. Munger also added two hits in addition to her performance on the mound. The Saints continued their success in the second game of the double header, beating Northwest 9-1 behind a dominant pitching performance from another first-year, this time Miller. Miller pitched six innings giving up only one unearned run on five hits and striking three. The Saints’ energy both on and off the field has been one of the main reasons for their early season success. “We win by creating our own tempo and energy. I thought our energy was good on Saturday, we had some ups and downs but we’re starting to get more consistent. We play our best when we have a lot of energy,” said Miller. Offensively, Smith, Dani Wall, and Jackie Schmaeling who each had two hits led the Saints.